Look, up in the sky! It’s a bird! It’s a plane! 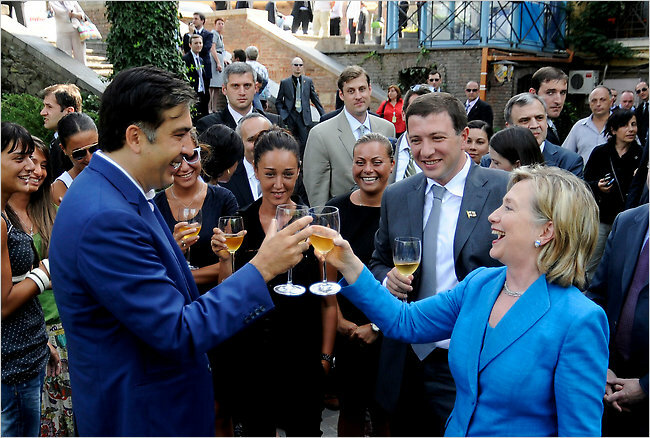 No, it’s Mikheil Saakashvili! In Russia, when thousands want to march against the president, their leaders don’t even make it to the meeting place. Vladimir Putin has them arrested before they ever get there, and then his stormtroopers crush the rank and file, as they did just last weekend in Vladivostok. Once, Putin went so far as to draft Oleg Kozlovsky, one of the lead organizers, into the armed forces in order to block his participation. Over and over, those who most staunchly criticize the Moscow Kremlin (from Starovoitova and Politkovskaya to Litvinenko and Markelov) have been brutally shot and killed. There is not even one such instance under Saakashviili, who has no connection to the secret police where Putin spent his entire career. In Georgia, by contrast, they simply march, and live to tell the tale. 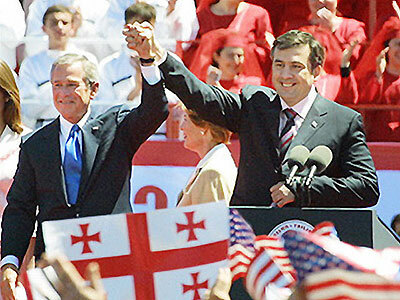 Saakashvili’s only response is to call elections — real elections, with opposition candidates supported aggressively by Russia — and win them over and over, exposing Russian power as inherently laughable. No wonder Putin hates this heroic Georgian patriot so much. Russia police arresting a protester in Vladivostok last weekend. In Russia, the economy is in freefall, shrinking at least 7% in the first quarter of this year. Georgia, by contrast, expects 3-4% economic growth this year, up from 2% growth last year under Saaksashvili’s leadership. Russia did better than Georgia in 2008 but Georgia, of course, didn’t have to overcome the obstacle of being invaded by a country ten times its size and having a huge part of its territory lopped off, as Georgia did, and Georgia doesn’t have any of the fossil fuel wealth by which Russia is blessed. What would have become of the Russian economy last year if, in addition to all the other horror, it had been invaded by China? We don’t dare imagine. In 2007, Georigan ecnomic growth was an amazing 12%. One could almost think that the Kremlin decided to attack because it was the only way it could think of to stop Saakashvili’s economic juggernaut. Nemtsova: Who wants your resignation? 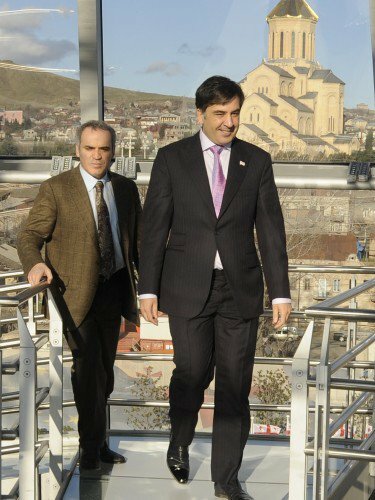 Saakashvili: Mostly unemployed people. We fired about 250,000 people as a result of our reforms. A big percentage of these people have not managed to find themselves in the new economy. Fighting corruption and crime, we put thousands of people in jail. In Tbilisi alone we convicted 8,000 people; all of their relatives are outside today, asking me to resign. What is the most painful part of the criticism? I am not hurt by the criticism in Georgia, as I am hearing it from two opposition TV channels all day long. I did not expect the West to put all the relationships with us on hold while waiting for this revolution. An official delegation from France decided to postpone their visit. A Turkish company moved a scheduled contract signing until after April 9, and an Arab company until April 12. What is the matter with these people? Do we stop going to Paris or Strasbourg during their street protests? Sweet, sweet victory in Georgia! Almost seven decades ago last Tuesday, Russian soldiers marched hand in hand through the city of Brest with the army of Nazi Germany. They were celebrating the one-month anniversary of the military pact signed by their two maniacal dictatorial leaders, and contemplating dividing up the world between them. 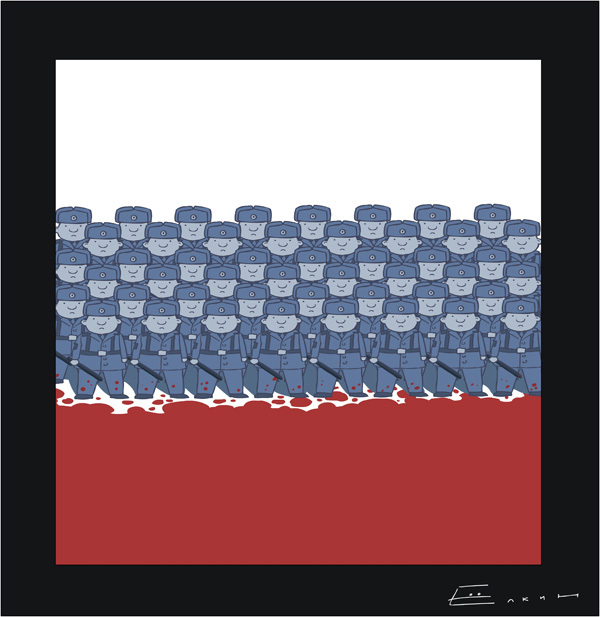 As we look back on that event today, and reflect upon the total failure ultimately met by both regimes, ending in national collapse, we cannot help but draw parallels to the recent atrocity of Russian aggresion in Georgia. Just as little has come of it. Just as surely, it represents the beginning of the end for Russia. Returning Russian fire with a withering fusilade last week, Georgia’s valiant president Mikheil Saakashvili first launched a devastating op-ed in the Washington Post and followed it up with a transcendant address to the United Nations General Assembly. 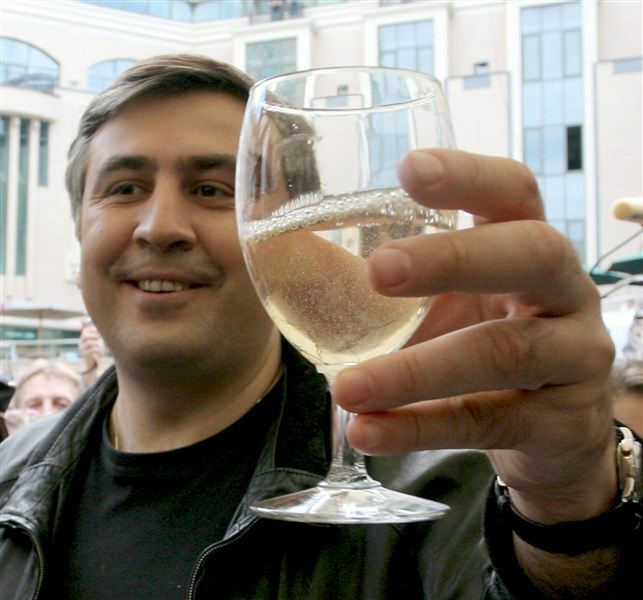 The man Russia’s “president” and “prime minister” (neither of whom have been ever faced a competive election or critical mainstream media, as Saakashvili does on a daily basis) have called “criminal” fought back with intelligence, civility and facts, and left only smoldering rubble on the Russian side of the field of battle.